Manage a complex Sales Process at all stages by using Sales Order Processing to create enquiries and quotes, and then convert these to firm orders. Accuracy in Sales Margins and the integration with credit control are key tools to maintain profitability, and these are important parts of the Sales Order Processing system. Customers over limit or customers on stop are both recognised in the process. The Sales Desk Workflow is an ideal mechanism for managing SOP activity. Quotations may be sent to customers electronically and images of every stage of any quotation sent, along with accompanying message text are all viewed and stored within the enquiry, and then subsequently within the order. Allocation of stock to orders may be by automatic or manual methods as required, with Back-To-Back Purchasing and direct delivery of special orders being common requirements for our customers. 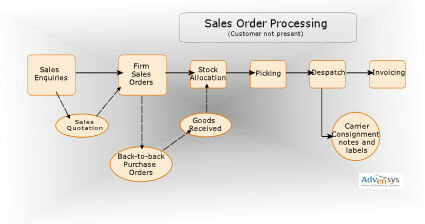 Sales Order Processing also integrates with purchase requisitions for use by buyers, who buy in a regular rota or pattern. Advensys Ltd recognises all trademarks.